British entrepreneurial talent is on tour in Silicon Valley as part of a government-backed project to provide a window into the UK's start up scene. Twenty companies were chosen from over a hundred for the first Web Mission 08 to showcase the high level of technology emerging beyond the Valley. Organiser Oli Barrett said: "Silicon Valley is such a hub of innovation you have to experience it first hand." The project is supported by UK Trade Invest, Oracle, Sun and Make Your Mark. One of the biggest backers Stateside is fellow Briton Michael Birch who along with his wife Xochi founded the social media network Bebo. Bebo was recently sold to AOL for $850m. He says: "The mission represents an amazing opportunity for the best of entrepreneurial UK talent to visit Silicon Valley and learn for themselves the differences that make the US a breeding ground for innovation and more importantly successful execution of ideas." 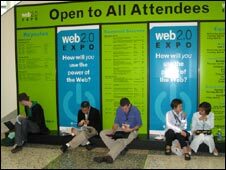 One of the stops for the group was Web Expo 2.0 in San Francisco, a gathering of designers, architects, engineers, developers and businesses focusing on the future direction of the Web. Damon Oldcorn, chief executive of Zebtab, a desktop tv application promoting sport and news, says he hopes to forge relationships and lay down plans to expand in the US. "The game is back on again. We were here during the dotcom era with another company I built but that tapered off in 2001. It's pretty obvious the buzz is back. The money is here, the alliances are being struck and there are deals to be done and it's the place to be again." Fellow entrepreneur Alicia Navarro isn't as convinced. She started SkimBit, billed as the world's first social decision making tool, around two years ago. Alicia says while the Valley is inspirational, her loyalties lie elsewhere. "I want to be part of the movement that makes the UK a world-class place for entrepreneurship and I think coming here is a way to promote just how great a place it is to have a business." Mr Barrett says putting the UK on the map was also one his main reasons for organising Web Mission 08. And he says he recognised early on that sheer force of numbers would play to his advantage and to that of the start-ups taking part. "My hunch was that if companies come over here on their own they would find it hard to access amazing opportunities and individuals. However together in a group doors can suddenly be unlocked and that's what we have found on this first ever web mission." And that approach definitely seems to have worked. Since the Mission arrived in the States, they have been wined and dined and have visited the offices of some of the big names that dominate the skyline of Silicon Valley. Oracle, Google, HSBC, Sun Microsystems, and Hewlett Packard all opened their doors to these budding billionaires of tomorrow. High level executives and Venture Capitalists also took time to meet and discuss with the entrepreneurs how they can best tap into what Silicon Valley has to offer. 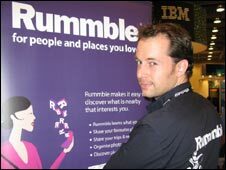 For Andrew Scott, the founder of Rummble.com a mobile technology company, having some personal time with those who have made it has been invaluable. "Meeting and spending time with some of the founders of the more successful companies here like Jim Buckmaster of Craigslist and Michael Birch of Bebo has been great. Not just because they give you insights but because they also remind you that it was tough for them at the beginning as well. " The proof of just how successful Web Mission 08 has been might be measured by some in terms of deals done, but for Mr Scott it is something that cannot be summed up in dollars and cents. "For me personally having this time with your peers has been great. Gone are the days when you would say 'Oh I am not going to talk to him because he does something vaguely similar to us'. "There is an open culture building on the web and also in the way people are doing business. For our generation of entrepreneurs and start ups, we have all very much embraced that." 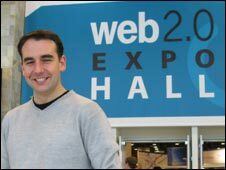 And while Oli Barrett is hoping that Web Mission 08 will turn into Web Mission 09, he is also looking further afield than Silicon Valley. "The response we have had here has been so great that we would love to come back to Silicon Valley but we also want to consider other places such as India and China. So watch this space."